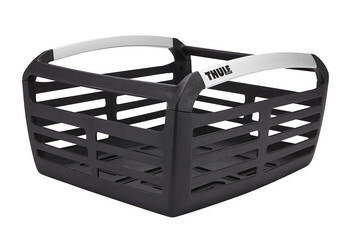 A Thule bike basket is a great way to add stylish, versatile storage to your bicycle. Mount it securely on the front or rear rack – it’s up to you! Versatile and stylish bike basket that securely mounts to front or rear bike racks and delivers plenty of added storage space. A Thule bike basket is a great way to get extra storage on the front or back of your bike. Easy to mount on almost all front or rear bike racks, the bike basket gives you room even for larger bags and loads. But what stand out most are the tough yet sleek, space-age design and materials. Because, after all, why shouldn’t it look great too? Rest assured that a Thule bike basket will hold your gear securely and stay on your bike safely. Designed and built to last, we nevertheless test our products to really make sure they’re up to the task. At the Thule Test Center™, we test with heavy loads and put them through long-distance simulations as well as exposure to heat, cold, water, and sun. Everything to ensure they do their job for years to come – and keep their great looks while they’re at it.